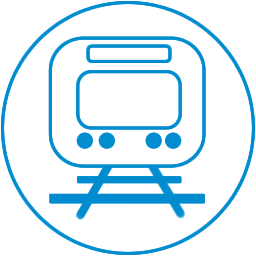 Melbourne's suburban rail network has 15 electric train lines services and 5 diesel services stretching across the entire Melbourne area. The 15 electric train lines and Frankston to Stony Point Diesel service are operated by a company called Metro Melbourne. Also Sunbury, Melton, and Pakenham are operated by a company called V/Line. Most train services start from, or travel to, Flinders Street Station (V/Line services are from Southern Cross railway station). Most electric train services travel through the city loop, which is made up of 5 railway stations. 3 of these stations are underground subway stations and 2 are ground level stations. The city loop stations include Flinders Street, Southern Cross (Spencer Street), Flagstaff, Melbourne Central and Parliament. Night Trains will run hourly all night on weekends on all lines, except Stony Point and Flemington Racecourse lines, City Loops stations and Southern Cross will be closed. Many stations will benefit from more frequent train services through the night, where they are serviced by two or more train lines. For example, key stations such as Footscray, Caulfield, Clifton Hill and Burnley, and several others, will have two trains an hour. During this time, trains to Alamein terminate at Camberwell. Trains to Williamstown terminate at Newport. For the Alamein line train service, catch the Belgrave or Lilydale line train services and change at Camberwell. For the Williamstown line train service, catch the Werribee train line service and change at Newport. Non-PSR (Non-Passenger Service Requirement) run predominantly on weekdays.